For garden purposes there are two types of beans: bush beans and pole beans. Bush beans grow on small, self-supporting plants, while pole bean plants will climb anything that they can wind around, not just poles, and so should properly be called “climbing beans.” Within these two types there are an incredible range of different varieties, some grown for the pods, which are eaten fresh or frozen; the immature shelled seeds, eaten fresh; or for fully mature dry shelled beans, which are stored for winter use. The taxonomic name is Phaseolus vulgaris. Closely related are runner beans, popular in England, which are Phaseolus coccineus. Those grown for their pods are the common “string beans” of our childhood, though only a few kinds, like the French “filet” types, still have strings running along the seam of the pod (and must therefore be “filleted” before use if allowed to mature). These days they are usually called “snap beans” because of the way, at the proper harvest stage, they snap in two when bent. Snap beans can be green-or purple-podded—or even yellow, but then they are called “wax beans.” If the pods are flattened instead of round they are called “Romano” beans, and you will find that there are purple and yellow Romanos as well as the green. All of these variations exist in both bush and climbing types. One very special kind, traditionally from Italy, are the crescent podded “Annelino” pole beans, which come in both green and yellow forms. Any of these beans, plus myriad others, can be allowed to mature fully and dry for shelling and winter storage. Every region of the country has its traditional favorites, such as the Flageolets of France, or the Cannellone and Borlotto beans of Italy. Some beans, have been re-classified from the genus Phaseolus to a separate genus, Vigna. Examples include Asparagus beans (Vigna unguiculata), Mung beans (Vigna radiata), Adzuki beans (Vigna angularis) and Hyacinth beans (Dolichos lablab, or Lablab purpureus) all of which are popular in Asia. For our purposes, however, they are just beans! All these beans are legumes, which means that their roots play host to a kind of soil bacteria capable of extracting nitrogen from the air—itself about three-quarters nitrogen—that makes up almost one-quarter of the soil by volume, and “fixing” it in small warty nodules which form on legume roots. This symbiotic relationship between legumes and the rhizobial bacteria not only helps the beans themselves grow, but stores nitrogen for later crops. This makes beans (and peas, also legumes) a valuable part of any crop rotation scheme. Dusting the seed with a purchased bacterial inoculant (available from most seed houses and garden centers) just before planting will make sure that there are plenty of bacteria available to do the job. Beans are a warm-weather crop, and cannot be planted until after all danger of frost. We plant bush types an inch deep, two rows to a three foot wide bed, width eighteen inches between the rows and six inches between the plants. Sow a seed every two inches and then thin out the weakest plants as soon as they have four leaves. For equidistant spacing on a hex pattern, poke three seeds into the soil six inches apart each way, the thin out the two weakest in each group. The average family will need five to ten feet of beans (ten to twenty plants) per person, as each plant yields about a quarter pound of beans. Bush beans will set one or two flushes of pods, but should then be removed and replaced with another crop. To lengthen the harvest period, either replant the same cultivar more than once in temporal succession (every 2-3 weeks) or a range of cultivars of different maturities in varietal succession . It is a good idea to provide bush beans with some support if you have fertile conditions because the weight of the pods may cause the plants to droop. Try to keep bush beans upright and the pods off the ground. A simple way to do this is with a Quonset trellis of 7-8 squares. That will allow the beans to grow up through the trellis and set their crop on top, where it is accessible, This will also keep the pods clean. 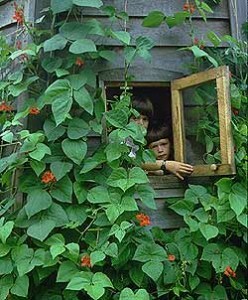 These runner beans add a special touch to a child’s playhouse. For continuous crops from a single planting, or if space in the garden is limited, grow pole beans. Most varieties will grow 8-10 feet tall if given good conditions, and will bear all the way to first frost if you keep them picked and can take good enough care of them to avoid yield losses due to insects or diseases (see below). They also make an attractive cover for various parts of the garden hardscape, such as this playhouse for our children, which is clothed in a number of different climbing plants, including a Scarlet Runner bean. The traditional method of trellising climbing beans was to set ten-foot long stout poles about two feet deep, and plant six to twelve seeds, an inch deep, around the base; then thin out the weakest plants at the four-leaf stage, leaving four to six plants. Rough surfaced poles work better than smooth, planed lumber so that the vines have something to hold onto. Another method — especially popular with kids — is make a bean teepee. To do so, either lean together the tops of four twelve-foot poles set in the corners of the bed, or set a single post in the center of the growing bed, drive stakes in a ring around the outside, and then run twine from the stakes to the top of the pole. If you use the twine method you can control the shade of the teepee more closely and fall cleanup will be less trouble. 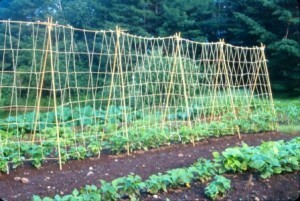 Still another way to trellis pole beans is to plant the seed in a single row down the center of a three foot bed, just as if they were bush beans, and then erect an untreated twine trellis for them to grow on. One kind of simple trellis is made from eight-foot-long 2×2 posts sunk two feet in the ground, ten feet apart. A ten-foot-long piece of electrical conduit, flattened at the ends and drilled to accept a wood screw, is used to join the two posts at the top. Connect the bases of the posts an inch or two above ground level with a run of twine, then run a vertical criss-cross of twine back and forth up to the horizontal conduit, with cross strings running from post to post every foot or so. While this takes a little extra time to erect, it gives the beans plenty to hold on to and comes down very quickly in the fall. Myself, I would rather do the extra work in the spring. If you want to do the reverse, just use twin or cable ties to fasten upright panels of concrete slab wire to the overhead conduit. This goes up very quickly, but is more laborious clean off in the fall. You should also fasten the panels to one another and to the end posts at the base of the panel. My favorite method, though, is to erect a four-legged bamboo teepee at each end of the bed and lash a horizontal piece of bamboo across the top to which the twine can be fixed. One of the beauties of this system — aside from its visual appeal — is that it is very wind resistant. And, because untreated twine decomposes quickly in contact with the ground, fall cleanup is a snap: just cut the lines loose from the posts, roll up the whole affair and throw it on the compost pile. By spring, they’ll be part of the garden again! Once the plants are up, keep the bed clear of weeds. Since beans are shallow-rooted, mulching or close planting works better than too frequent and vigorous cultivation. Close planting can cause problems in wet years, though, as it can foster development of blights and rots. Stay out of the bean patch during wet weather or after watering, as you’ll spread whatever disease spores are present from plant to plant on your tools, hands, and even pant legs. Many of these diseases are seed-borne, so buy seed grown in the western United States, where the dry conditions make it easy for seed growers to prevent disease. Most of the bean seed sold by seed retailers, both mail-order and on seed racks, is grown there. If you save your own seed, be sure not to save any seed from plants that show signs of disease on either the leaves or the pods. Also be sure to rotate the bean patch, so that any spores or bacteria left in the soil won’t find a ready host the following spring. Diseases can also overwinter on your permanent trellis parts, so if disease has been a problem you should either sterilize your stakes and posts or use them for some other crop the following season. One of the beauties of a cut-and-compost, untreated twine trellis is that there is no place for disease and insects to overwinter but on the posts, and they can be easily treated with a bleach dip or spray. This is made by mixing with water at a 10:1 ratio with the bleach and then either dipping the stakes, or spraying the solution on the posts. 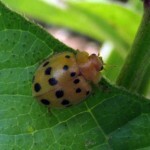 The major insect pest of beans is the Mexican bean beetle. They look like large ladybugs: up to 1/3 inch long, with an oval body that is yellow to brown and eight black spots on each wing cover. The eggs are laid in yellow clusters of four to five dozen on the undersides of leaves, and after hatching grow into 1/3-inch long yellow grubs, with six rows of spines that make them look almost fuzzy. In the process they make a lacework of the bean leaves. Once they’ve grown to full size they attach themselves to an unhurt leaf, which they may roll around themselves, and pupate. After they emerge as adults the whole cycle starts over, and may repeat two or three times a season if time permits. The time from egg to adult is about a month, so there is plenty of time for the attentive gardener to interrupt the process. The major defense is the simplest: pick off the beetles and crush them. The same applies to the eggs and the larvae. If the infestation is severe you can dust with rotenone. As the surviving bean beetle adults overwinter in garden side debris, keeping the place tidy will help break their reproductive cycle. Also, quick succession plantings of bush beans can avoid giving them a chance to build up their numbers. 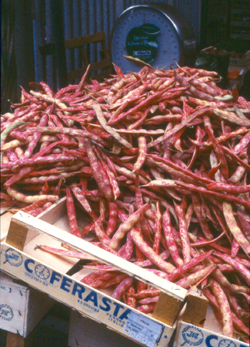 Italian shell beans heaped high at a market stall in Venice, Italy. Harvest snap beans promptly, as soon as the pods begin to swell with seeds; this signals the peak of flavor. If you leave them past this point, the plants will stop producing and move into a seed-ripening phase. This is particularly important for pole beans, which, if you keep them picked off, will produce over a very long period. 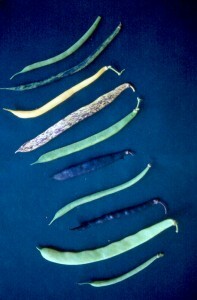 Yellow-podded beans should be left long enough to develop their characteristic color; purple-podded beans are colored from the start. French filet types should be harvested very young, and unless you are growing the newest “faux filets,” they will need almost daily attention during the harvest period. The pods should be harvested as soon as they reach 1/8 inch in diameter, regardless of the length, though it will usually be three to five inches. There should be no swelling, and when snapped in half, the two pieces should break cleanly, rather than remaining connected by a string along the pod seam. Fresh shelling beans such as flageolets and limas should be harvested as soon as the beans themselves begin to separate from the pods. You can feel this by squeezing the pod—there will be a tiny bit of give before you feel the bean inside. Open a pod. The beans inside shouldn’t be moist on the surface, and should have shrunk back a bit from the pod. Color is not a good indicator of maturity, as shell beans come in many colors. To harvest as dry beans, wait for the pods to dry completely on the plants, then cut the plants off at ground level and hang them upside down in a dark, dry, airy place. Check a few pods periodically, and once the beans have hardened you can take the plants and beat them against a tarp on the ground to loosen the pods. Shuck them and store the beans in glass jars.